← Register now for 10/18 Webinar: This is Your Brain on Drugs. This is Your Brain on Trauma. We are excited to feature our new Toolkit this October! Brief Overview: This toolkit provides trauma-informed guidance on integrating questions about mental health and substance use coercion into routine mental health and substance use histories and into in-depth intimate partner violence (IPV) assessments in primary care and behavioral health settings. 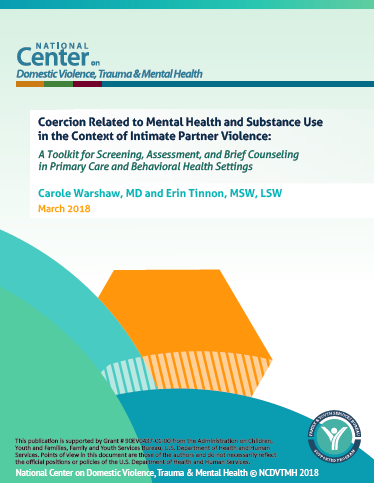 This toolkit is intended to be used in conjunction with comprehensive guidance on trauma-informed approaches to screening, assessment, and brief intervention for intimate partner violence in healthcare, mental health, and substance abuse treatment settings (For additional guidance, see the resources section of the toolkit). Given the many forms of IPV and range of experiences people may have, being able to think creatively with survivors about their particular circumstances, priorities, and needs is critical to strategizing about safety and developing meaningful treatment options. There is now a large body of research demonstrating that experiencing abuse by an intimate partner is associated with a wide range of health and mental health consequences. Some are the direct results of physical and sexual violence; others are related to the traumatic psychophysiological effects of ongoing abuse. 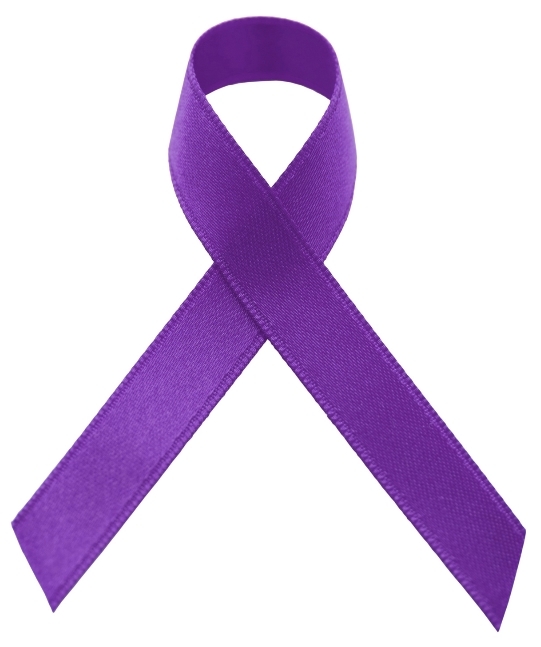 Both clinical and population-based studies indicate that victimization by an intimate partner places people at significantly higher risk for depression, anxiety, posttraumatic stress disorder, somatization, medical problems, substance use, and suicide attempts, whether or not they have suffered physical injury. In addition, there are high rates of IPV among people accessing services in health and behavioral health settings (Phillips, 2014; Dillon, Hussain, Loxton, & Rahman; Nathanson, Shorey, Tirone, & Rhatigan, 2012; Trevillion, Oram, Feder, & Howard, 2012; Howard, Oram, Galley, Trevillion, & Feder, 2013; Riviera et al., 2015; Warshaw, Brasher, and Gill, 2009). Less well researched, however, are the ways that people who abuse their partners engage in coercive tactics related to their partner’s mental health or substance use as part of a broader pattern of abuse and control – tactics we refer to as mental health coercion and substance use coercion. These tactics include an abusive partner’s efforts to intentionally undermine their partner’s sanity or sobriety, interfere with their treatment, control their medication, sabotage their recovery, and discredit them with friends, family, helping professionals, and the courts. Pervasive societal stigma associated with substance use and mental health conditions contributes to the effectiveness of these tactics (Warshaw, Lyon, Bland, Phillips, and Hooper, 2014). Intimate partner violence (IPV) can be understood as intentional, ongoing, systematic abuse intended to exercise power and control over an intimate partner. This can take the form of physical, sexual, emotional, and/or economic abuse, and can also include emotional manipulation of children, threats related to deportation or child custody, and outing a partner’s gender identity or sexual orientation, in addition to coercion around reproduction, substance use, and mental health. When we say partner, we mean someone with whom a person has an intimate relationship including current or former spouses, sexual partners, someone a person is dating, or someone with whom a person has a significant emotional connection. 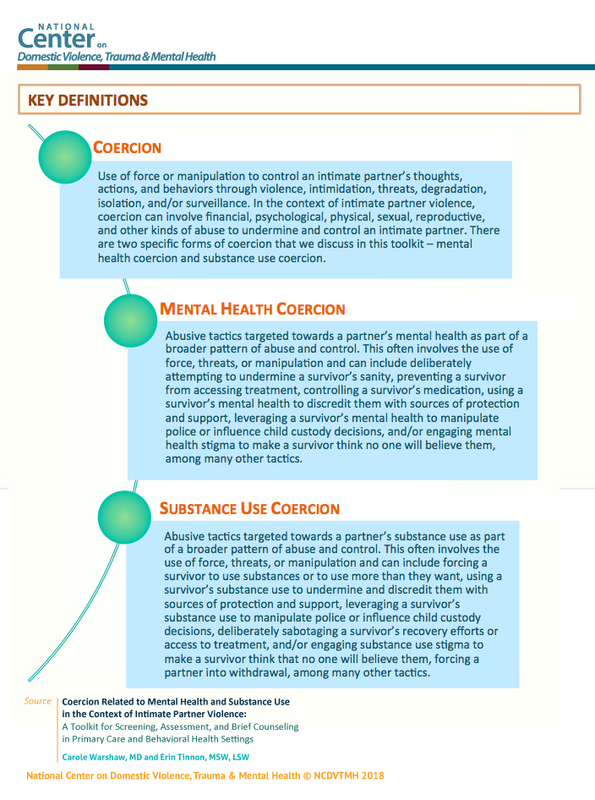 It is important for clinicians to be aware of the ways that abusers use coercive tactics to control their partners and of the impact these tactics have not only on survivors’ health, mental health, and well-being but also on their ability to engage in treatment and achieve their treatment and recovery goals. While we use the term intimate partner violence throughout this document, community-based programs often refer to themselves as domestic violence and/or sexual assault agencies. In addition, we use the terms “patient” and “client” interchangeably throughout this document knowing that there are a variety of terms used to describe people who access our services. This toolkit provides trauma-informed guidance on integrating questions about mental health and substance use coercion into routine mental health and substance use histories and into in-depth IPV assessments in primary care and behavioral health settings. This toolkit is intended to be used in conjunction with comprehensive guidance on trauma-informed approaches to screening, assessment, and brief intervention for IPV in healthcare, mental health, and substance abuse treatment settings (For additional guidance, see the resources section of the toolkit). Given the many forms of IPV and range of experiences people may have, being able to think creatively with survivors about their particular circumstances, priorities, and needs is critical to strategizing about safety and developing meaningful treatment options.